The master bedroom features a handmade bed and armchair by John George Fine Cabinetry. The bed is made with French walnut and brass. The chair is covered by a William Morris fabric. Chandeliers are made by Agapanthus Interiors. Doors to the left open into a spacious walk-in closet and master en-suite. Amanda Pollard added this to Houzz Tour: Is This the UK’s Greenest Victorian House? The bay windows in the living room and the master bedroom, pictured here, presented some challenges, as the team wanted to insulate the internal wall. “To overcome any moisture-related risks, we created a detached internal timber frame,” says Kit. But to make it all fit, they had to completely remove the internal brick layer and tie the outer layer to the timber frame for support. 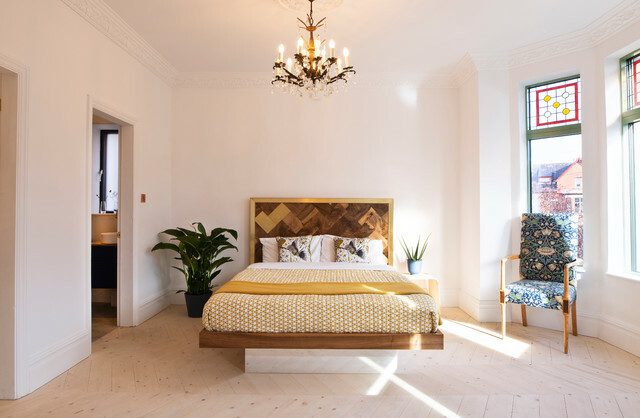 The original floorboards, treated with a breathable varnish, have been laid in a chevron pattern in numerous rooms throughout the house. The bay windows in the living room and the master bedroom, pictured here, threw up some challenges, as the team wanted to insulate the internal wall. “To overcome any moisture-related risks, we created a detached internal timber frame,” Kit says. But to make it all fit, they had to completely remove the internal brick layer and tie the outer layer to the timber frame for support. Love the bed!